Too often we read about new research using mice, rats, non-human primates, and fish. These few categories of animals teach us a lot about biology and how we may intervene to cure or alleviate a human disease. But, what about other animals? Do scientists only study just a few different species? 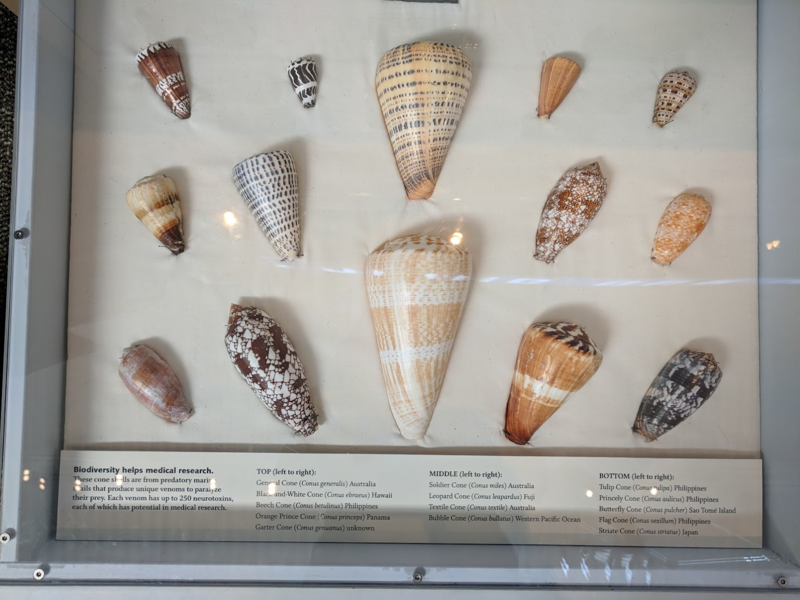 I recently visited the Natural History Museum at the University of Florida and found an odd animal that I didn’t know was used in medical research: Predatory Marine Snails, a.k.a. Cone snails. The museum had a drawer of these snails (see below) and noted that they are used in medical research because the snails use unique venoms to paralyze their prey. The unique venoms have up to 250 neurotoxins, each of which has potential in medical research. How cool! Side-note/Nerd-Flex: I visited quite a few Natural History Museums these past few months–Cleveland, San Diego, Zurich–they’re a great resource for learning about the types of animals living near the area–I mostly go to be a better bird spotter while I’m around town. So, what exactly are cone snails and what are neurotoxins? After a quick search on Wikipedia, I found that cone snails are carnivorous, predatory, and extremely venomous. They hunt and eat marine worms, small fish, molluscs, and other cone snails using a harpoon, called a toxoglossan radula, to inject their prey with neurotoxins. See the video below. As shown in the video, a cone snail can take down a whole fish with just one sting. Although cone snails often just attack small prey, some have a very powerful sting that can penetrate wetsuits and kill humans. This possibility of fatality to humans is one reason why we study their venom, or neurotoxins. Neurotoxins, specifically target the nervous system. Thus, stings from cone snails often cause intense localized pain, numbness and tingling, muscle paralysis, and sometimes loss of vision and respiratory failure. Fortunately, only about 27 humans have died from cone snail neurotoxins, ever. Beyond humans’ minimal risk of being stung, cone snail neurotoxins are also studied for its potential in creating pharmaceutical drugs. As you might have seen in the video, the neurotoxins acted on the fish very quickly. Thus, if properly understood, some neurotoxins could have fast acting effects on the human body. Also, cone snails have a wide-variety of neurotoxins–sometimes a single cone snail has up to 250 different neurotoxins. Such great variety may mean that each neurotoxin uniquely and precisely targets different areas of the nervous system. That means that cone snails could lead to many different targeted drugs for humans. One drug in particular that was isolated from the magician cone snail, Conus magus, is Ziconotide; also called Prialt (read more). Ziconotide, is a pain reliever 1,000 times more powerful than morphine. Unfortunately, Ziconotide must be injected directly into the spinal fluid because it lacks efficacy when delivered orally or intravenously. It is currently used for the management of severe chronic pain for patients that are intolerant of other pain treatments like systemic analgesics or morphine. Ongoing research is determining whether the drug can be formulated in a way that would allow less invasive methods (read more). There is also research investigating how other neurotoxins can be used as muscle relaxants, fast-acting interventions for heart-attack and stroke, for treating multiple sclerosis (read more), and even cancer (read more). 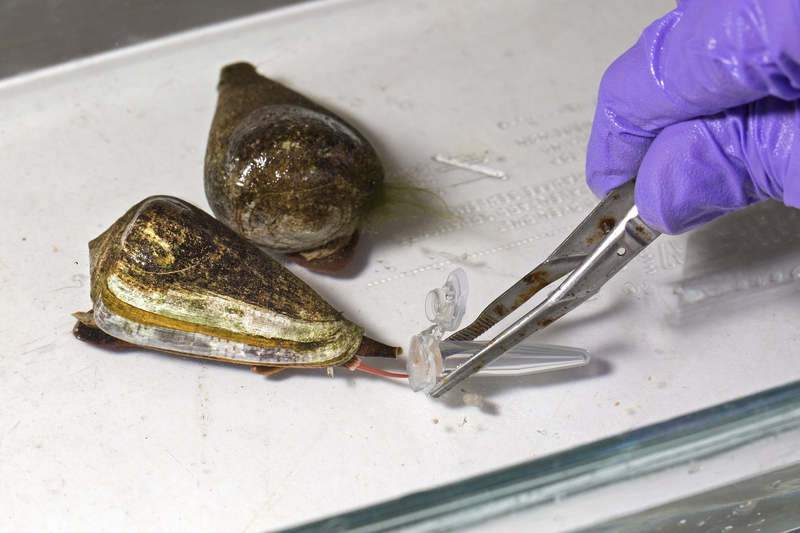 That’s a quick look into cone snails and their use in medical research. I hope you found it exciting and informative. Maybe I will stumble on another unusual animal used in biomedical science and share it with you soon. See you at your local Natural History Museum! Posted on January 24, 2019 January 24, 2019 by EditorPosted in NewsTagged cone snaimls, neurotoxin, pain. Previous Previous post: Research Roundup: Preventing macular degeneration blindness; A vaccine to the bio-terrorism toxin ricin and more! Next Next post: Research Roundup: Using the flu virus to eliminate prostate cancer, the role of basophils in cancer and more!